According to the National Fire Protection Association, house fires affect an estimated 500,000 pets, 40,000 of which die from smoke asphyxiation each year. Our Pet Emergency window cling decals help to protect your pet(s) against emergencies or disasters while you are away from home by warning emergency services that there are live pets in your home that they are in dire need of rescue. You could save your pets' lives by simply attaching these pet decals to your window or another smooth surface - and leave home with peace of mind! Protect your pets even when you're not home. Simply write with a Sharpie marker the number of dog(s), cat(s, and bird(s). An extra line is included to list other instructions, pets or disabled people in the house. The top grade vinyl material ensures these decals will stay in place for years, in any surface they are adhered to. Removing them is also a breeze; unlike other stickers no glue or residue will be left on your windows! In addition you should carry a "My Pet is Home Alone" emergency card with you everywhere you go so if you are ever in an emergency situation and are unable to speak for yourself, your card will act as your In Case of Emergency (ICE) card and contains the contact details of the people you've selected to be notified of your condition and to look after your pets so you know they will be well cared for. The "Home Alone" cards are available in Pets, Dog and Cat versions. Check my store for these and other pet products. A portion of the proceeds get donated to The Algonquin Cat's Annual Fundraiser. Past fundraising recipients have included Bideawee, North Shore Animal League and Mayor's Alliance for NYC's Animals. Woodbridge Animal Shelter and Angel Paws have also received generous donations of money and food from our past fundraising efforts. ENSURE YOUR PETS' PROTECTION & SAFETY: A sudden fire, earthquake, flood or any other emergency may threaten your pet's life. 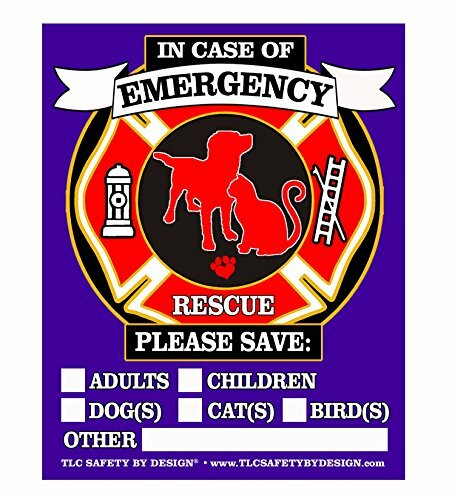 This decal notifies firefighters and/or rescuers of any dogs, cats, or any loved animals in need of rescue during an emergency or natural disaster. ADHERES PERFECTLY ON ANY SMOOTH SURFACE. NO RESIDUE EVER! The Front of Surface decals can be placed on any windows, doors, vinyl siding, vinyl fences or any smooth surface around your home. The Behind the glass decals are applied on the window glass inside facing outwards to help the decal stays bright and free from dirt and debris. 100% MADE IN THE U.S.A. FROM TOP GRADE VINYL. There is no adhesive involved - the decal can be removed at any point. Place on the OUTSIDE of the smooth surface, and then just gently rub it all over using a credit card to press out any air bubbles until it sticks to the window. DECALS ARE AVAILABLE WITH DIFFERENT OPTIONS TO BEST SUIT YOUR BUDGET and NEEDS. Choose from these options: BEHIND THE GLASS in quantities of 2 or 4, FRONT OF SURFACE in quantities of 2 or 4, or a VARIETY PACK in quantities of 2 or 4 which would include 1 or 2 of each variety.